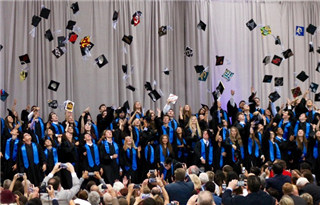 The 84 members of the Class of 2016, along with many family members and friends, enjoyed a joyful commencement ceremony on June 16th. After an introduction by Upper School co-heads Allegra Molineaux and Tim Betzala, Senior Class President Phoebe Wislar and Student Body Vice President Adrian Cassarubias gave moving speeches about some of the unexpected challenges and unforgettable opportunities they've faced over the course of their high school careers. All-School President Brij Shaney gave a humorous and heartfelt speech about how his teachers and classmates have helped him lean into discomfort and make the most of his years at Pacific Ridge. Then, Head of School Dr. Bob Ogle applauded the members of the Class of 2016 for their willingness to contribute solutions to some of the most pressing global issues of our day. A heartfelt and amusing video message from faculty and a musical performances by senior musicians preceded the presentation of diplomas and reading of the class's senior statement. The ceremony concluded with the graduation chorus performing "Blessings," and the traditional tossing of mortarboards. Congratulations, graduates!